I guess I forgot to write this yesterday. I did, however, watch The Stranger, the Orson Welles noir film about a Nazi hiding in disguise in a small Connecticut town in order to escape prosecution for war crimes. To the best of my recollection, no bicycles were featured in this film. I'm finding it increasingly difficult to disambiguate one morning commute from the next. "Oh, the gray day? When it was kind of rainy? And the three cups of coffee you had before leaving the house failed to do anything but causes the faintest enough flickering in your brain to get you dressed and on the bike?" Yeah. I guess it's just that time of year. I haven't missed the cold, but at least the cold has a jarring effect that snaps you into a sense of greater clarity. The dull gray haze doesn't. I don't want to dwell on this last part because it's negative and I don't like to be a negative person. "DON'T BE A NEGATIVE PERSON!" I affirm to myself in the mirror each day, mostly missing the point of daily positive affirmations, but it's not taking and so I'll be negative for a little because there's really no positive way to spin the dismal state of thinking about pedestrians and cyclists in DC by those who have the power to make their lives better or worse and almost always invariably choose worse. The former HQ of the Washington Post, a local newspaper, are being demolished and since this building sits along the 15th Street Cycletrack, the premier north-south bike route in the city, the construction is causing something of a disruption, but only indirectly to bicyclists. The construction crew has fenced off the sidewalk and very helpfully placed signs telling pedestrians that they should cross the street. Pedestrians are, however, not morons and don't blindly follow stupid signs and instead walk in the cycletrack. I don't blame them for this at all, since it's exactly what I'd do. However, it creates a situation in which pedestrians and cyclists are mingling in the cycletrack and there's not even any attempt by those in charge to recognize that this is a suboptimal organization and that perhaps instead the parking lane could, with the use of space age orange cone technology, be converted into additional space for cyclists so as to mitigate the conflict. Because 1) this makes sense and 2) this is what the law says is supposed to happen. But nope. 1. This was very predictable. 2. That this was predictable is sad. 3. Inviting pedestrians to walk in the cycletrack shows little regard for people on foot or on bicycle. 4. Worse yet, not even considering WHAT MIGHT HAPPEN is a result of closing the sidewalk demonstrates a lack of imagination so stunning that it borders on incompetence. 5. Worse yet, knowing full well exactly what would happen and proceeding with it anyway, demonstrates apathy bordering on contempt. 6. Dignity. People have dignity. And this doesn't go away when they don't travel by car. The dignity belongs to the person and not the car. And yet, here we are. This is not how you treat people you respect. 7. It's hard to see how this arrangement is compatible with a Vision Zero regime. 8. This is the middle of downtown, a highly foot trafficked area. 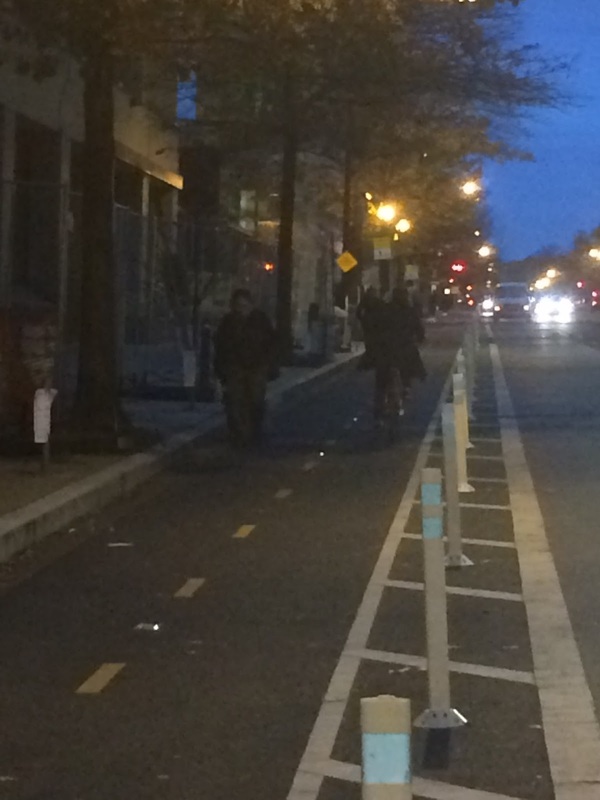 This is the premier cycling route in DC. That this closure might cause a problem shouldn't have snuck up on anyone. 9. It's highly likely that no one will die from this. It's also highly likely that no one will be grievously injured. 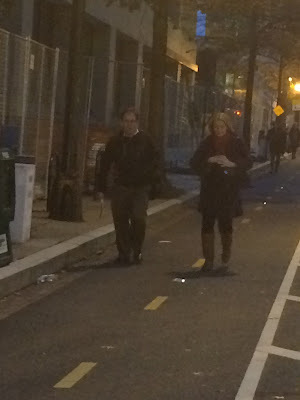 Because bikes aren't cars and bicyclists successfully (or at least no unsuccessfully) share paths and other narrow spaces with all manner of walker, runner, jogger, in-line skater all over the DC region with little to no incident. 10. That no one will die doesn't mean this is a good arrangement. 11. I don't know what we're supposed to do to unwind the culture that enables this. There's already a law that says don't do this. Culture > law. Laws are easy to change. Culture not so much. 12. Most people won't think that this is a big deal. Construction has to happen, sidewalks need to close. People are sometimes inconvenienced. Life goes on. So bikes and pedestrians have to share, so what? Today I didn't go to work, but I did bike and walk around a little. Biked down to SW and then walked around and eventually up L'Enfant Plaza and across the Mall and then I took the Circulator back to Union Station (I have thoughts on this too, but I'll spare you- for now) and then biked home from Union Station. As someone who really loves to walk (more than biking, even), Bikeshare really enables me some excellent walking trips with quick bike rides at the start and end of each walking jaunt. Thanks Bikeshare. Yea, you'd think that between DCRA and DDOT and DCPW and Vision Zero folks there would be at least a tiny bit of forethought on display. But no. We've been here before Sidewalk closing + cycle track = problem potential. Can't we at least get one guy whose salary we're paying to think about the non-motorists? Another inconsiderate bit of construction rerouting is on V St. near the corner of 15th. The construction crews have closed the sidewalk and put up plastic barriers that seem to be moving further and further into the road with each passing day, forcing drivers to enter the bike lane on the other side of the street. Seriously? The latest update to DDOT's standard construction drawings includes a sheet (605.11) for just this occasion. What's the point of having standards if they're not going to use them? "space-age orange cone technology" is v. good. They could always do what the construction company closing the sidewalk at 10th and F has done: put a big fat guy in a reflective vest and a hardhat out at the corner threatening any pedestrians who approach the with physical violence. I thought this was a nice touch. The lack of implementation of the law is the real problem. The bike lane is for the bike, the pedestrian is for crossing the street. We should all be responsible on respecting places. This can caused a lot of confusion later on. A number of folks (including myself) reported this to the District prior to this posting, and walking along 15th and L Street today the fences have all been pushed back in and the sidewalks - or at least a portion of - have reopened to pedestrians. My guess - and my hope - is that once again overzealous contractors / construction crews blocked the entire sidewalk illegally and not that any permits were issued that allowed this to happen. Was great to have our sidewalk back this morning. The lack of common sense can cause many troubles in general. The contractors should be ban in terms of negligence and lacking safety precautions on the public. If you are new to this place and not familiar with the area, you could be in trouble by not seeing the street nicely.